The movie: David Robert Mitchell’s follow-up to It Follows is an opaque, labyrinthine, Lynch-meets-Hitchcock LA noir as a disenchanted Andrew Garfield searches for his mysterious neighbour after she disappears. Divisive, but we liked it plenty. The movie: Jake Gyllenhaal and Carey Mulligan star in actor Paul Dano’s directorial debut. Adapting Richard Ford’s ’91 novel, it’s the story of a crumbling marriage in ’60s Montana told from the perspective of a 14-year-old boy. The movie: British-Polish writer-director Pawel Pawlikowski’s first film since his Oscar-winning Ida tracks a doomed romance across Europe, spanning the entirety of the 1950’s. The movie: Palme d’Or winner (Winter Sleep) Nuri Bilge Ceylan returned to the competition with this 188-minute tale of a struggling writer, freshly graduated, returning to his small hometown. The movie: Gomorrah director Matteo Garrone returns to grit-paved mean streets for the tale of a gentle dog groomer who’s strong-armed into criminal activities with devastating results. The movie: Prequel to A New Hope in which a cocky wannabe pilot called Han meets-not-so-cute with a hairball named Chewbacca and embarks on a thrilling adventure. The movie: Based on a Haruki Murakami short story, Lee Chang-dong’s slow-burn, sublimely ambiguous thriller revolves around two guys and a girl but Twilight it most certainly isn’t. The movie: A gangster’s moll gets five years in prison for firing a gun to protect him. Getting out, she goes on a startling journey as she searches for the man she gave up so much for. The movie: A 12-year-old boy is in court to sue his parents for giving him life. Extended flashbacks show us why. 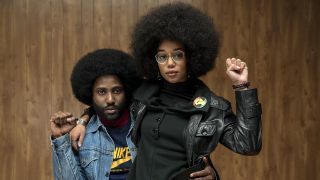 The movie: Spike Lee’s latest joint, starring Denzel’s son David John Washington and Adam Driver, is the crazy true-life tale of a black cop infiltrating the Ku Klux Klan in ‘70s Colorado. The movie: A dance troupe down some spiked Sangria and turn on each other in an orgiastic frenzy of rutting and killing.